Problem: Nvidia's GeForce GPU can display 3D, but in a different standard than the HDMI 1.4 plug that the upcoming crop of 3D TVs are going to use. Solution: Nvidia's 3DTV Play software, which reconciles the difference. That was easy! If you already own Nvidia's 3D Vision kit, you're eligible to get 3DTV Play as a free upgrade. If you'd rather not bother, you can pick up 3DTV Play separately for $40. 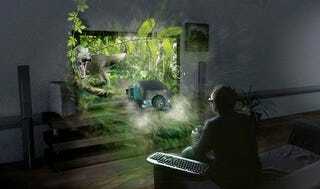 Since your 3DTV comes with stereoscopic glasses anyway, you may be better off with the standalone. It'll also support Blu-ray 3D in 1080p, 3D photos, or streaming 3D movie content.